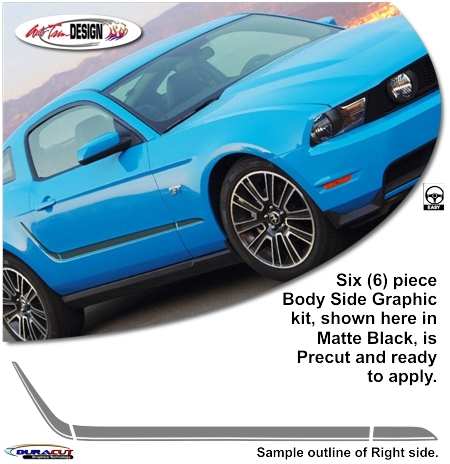 Set your Mustang apart from the rest with this great-looking Body Side Graphic kit for your '05-'14 Ford Mustang. Easy-to-apply six (6) piece graphic kit is available in a wide variety of colors. Graphic is specifically designed for the '05-'14 Ford Mustang V6 or GT and will not fit any other vehicle. Application of the graphic kit is very easy (set to install 0.25" (6.35mm) above the vehicle's distinct lower body line as shown) and requires NO TRIMMING.